Of all the flowers known for being at home in containers, one of the most popular is the geranium. Since these plants are profuse bloomers and they have a neat, compact growing habit, they are perfect as potted beauties, in addition to being a lush color burst in any landscape bed or walkway. Geranium plants prefer a day of full sun, but they will thrive indoors in a bright window as well as outdoors. So, choose your planter box, pot or other container (making sure it has proper drainage to prevent soil rot at the bottom), fill it with rich potting soil, add your favorite geranium, provide it plenty of sunlight, and then prepare to be dazzled. You can enhance the container-potted geranium with accents like tall, spikey Dracaena in the center of the planting, or asparagus fern or other trailing plants like Sweet Potato or Vinca Vine around the outer edges of the pot. Since Geraniums flower continually and abundantly throughout the warm season, they do best with only foliage accents and not competing flowers in the same pot. Regal Geraniums are available in a palette of rich, deep colors, including Velvet Red, Maroon, Burgundy, Black (which is really an intense, dark red), Double-hued Pink, and Clarina, a two-toned violet-colored flower. They also are available in delicate pinks and lilacs. Ivy Geraniums come in a rich dark burgundy appropriately named Merlot, Ruby Red and Salmon Rose. Stars & Stripes Ivy Geranium and Sangria Ivy Geranium are bi-color, semi-double flowers. All have a mounding habit and look neat and lush in a large pot. Some geraniums are beloved for their foliage as much as their flowers. There are varieties featuring scented greenery, with fragrances as interesting as Chocolate Mint, Citronella, Ginger and Cedar-Eucalyptus. Some specialty varieties have brilliantly colored leaves, with hues ranging from yellow-lime to rich glossy emerald, and variegated with contrasting shades of cream, white, rust, gold or rings of red. As a container plant, the geranium will thrive as a perennial, if allowed to winter indoors in a sunny window. Keep in mind that geraniums need more light than the winter sun will provide, so if you do not augment with an additional light source, the plant will become gangly and probably refuse to bloom until around the end of February. Keep it pruned and watered during this time as well as making sure to turn your container occasionally so all sides get equal sun exposure. 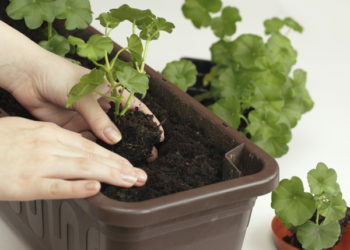 The biggest advantage of potting your geraniums is that you can continue to enjoy them indoors, long after the first frost has zapped the rest of your annual flowers. The other obvious advantage is that you can surround yourself with color where you don't have landscape beds available, like on porches, decks or patios. We bought some Appleblossom Rosebud geraniums from you this year. They look very nice. Wanted to know how to keep them over the winter? Janine, the Appleblossom Rosebud is a wonderful variety of geranium. I had one for several years that I wintered over. Geraniums in general are pretty easy to work with. There are a couple of methods to successfully getting them through the long gray winter. If it's not already potted, before the first sign of frost you will need to get it in a pot with well-draining potting mix. Once the evenings are consistently in the upper forties, you should bring the plant indoors. A sunny, southern window is the best location, but if that is not available, give it any window where it can receive the maximum number of hours with bright light. Make sure there isn't a draft, and if the temperatures are on the cool side, that is the best. Keep the soil only slightly moist; it's better to err on the side of dry. 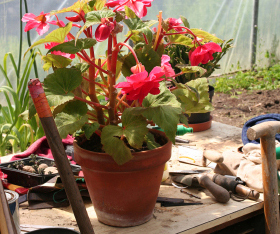 Geraniums have a very fleshy stem and are capable of retaining a fair amount of water in their structures. If it starts to get leggy, just prune it back a few leaf nodes to keep it bushy. If you don't have a sunny window, you can always set up a plant light; then you can put them anywhere you have space. When I was a child, my dad overwintered all his geraniums in the basement under lights. You can also take cuttings from your plant when you bring it in. Always good to prune them back, anyway! If you can get a cutting with 2-3 leaf nodes, then you can put them in a large pot with a well-moistened seed starting soil, or half potting soil and half vermiculite. Cover or tent with a clear plastic wrap to keep the moisture in until they root. Once they appear to be rooted (two or three weeks), you can remove the cover. Just make sure they stay moist. Pot up when they start to show new growth. Some folks have success with bare-rooting the plants and hanging them upside down in a cool basement or warm garage. The trick is to get them potted up before they dry out completelyusually around March. I've not had great success with this process, so I usually take cuttings and keep at least one original plant potted and under lights. Good luck with overwintering. Let’s hope this winter doesn't go on forever!